For some people, including myself, it can be a bit overwhelming to try a new software because of all the tools, the brushes and the options to play with. 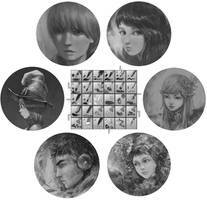 Most of these brushes are very slight variations from default tools or from brushes by Deevad. 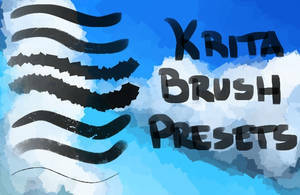 Check his profile to find a lot more Krita brushes ! Installation : The installation process is different than the rest of the pack. To import it, go to "Settings -> Manage resources" and then click on "Import bundle". 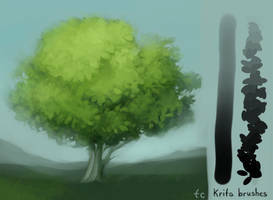 Content description : Both brushes are variations of my main "Flat Wet Brush". I use them to paint some organic details such as leaves, grass and clouds. 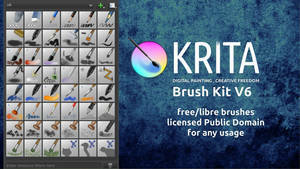 Installation : Open Krita's resource directory by going to Edit > Resources > Open Resources Folder. Go into the "paintoppreset" subfolder. Unzip the .kpp files into it. Restart Krita. Content description : Here is a quick explanation of how I use each of these presets. I use it at small size to sketch my underdrawings. With a larger size it can be used to simulate shading with the side of a graphite pencil. A brush without pressure sensitivity ! I use it to block-in my colours in early stages when I need them to stay fresh and clean. Your good old regular airbrush. I only use it for special effects, usually on layer modes such as overlay or increase/decrease saturation. It is useful for minor, discrete corrections thanks to its very soft edges. A very handy brush which will grab and distort/push what's inside its radius. It is very useful to make quick corrections when something is slightly misplaced. Applies a local Gaussian blur. I generally use it when I need to put something out of focus or to get a really really clean blending. Don't overuse it as it can quickly look too soft. Use the next one instead. 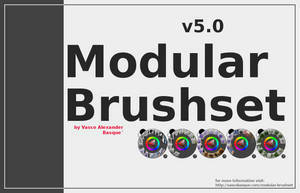 Thank you for your brush pack,looking forward to painting with them. im so confused, is there a video on this? Jus logged in to give you a big Thank You for sharing these!!! 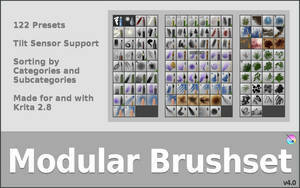 These are some of the most useful brushes I came across. As someone who likes to work more minimilistic and doesnt like to have his brushstrokes determined too much by texture and other settings, these have jus the right amount of breakup to them, not making the strokes look too constant , but also not being too detailed and deterministic in their looks. Was looking for some like these for a while. Especially the Flat_Wet_Brush is my favorite cause it is so versatile! And easily tweakable from there as a great start. The tools also have the exact bare and clean functionality you would need. They will be in my collection forever. 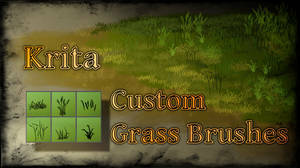 It looks like the download link only contains the vegetation brushes. Sorry, but could you re-upload again with everything in the bundle? I notice you commented another GDrive link below but it's not a bundle. Thank you for the repacking, I'm featuring your comment for everyone to see ! Oh ? Which one ? Not so many actually ! That brush is still my main one, though I've tweaked it a little bit since. First, I think that at the time, I had activated the "Overlay Mode" in the brush settings. That was a mistake x) It doesn't improve the blending quality nor the colours, in my opinion. However it was bothering me a lot when I was erasing with this brush because it would smear colours all over the place instead or erasing "cleanly". It was making layer management really messy. So I unchecked it and I'd suggest you to do the same if it is still activated. The other changes are pretty minor, I mainly tweaked the pressure curve. I wanted the brush to reach its maximum opacity sooner (meaning at a lower pressure) and I also wanted its minimum opacity to be higher. I prefer painting with more opacity these days and I don't want having to press to hard on my tablet for that. Otherwise I'm using two additional brushes which are in fact a variation of this one. One is an even more opaque version of the same brush, whose opacity barely vary with the pressure, but whose size vary a lot more. This is the brush I've used for this entire painting as well as for the vegetation here and there. So to recreate this brush, you'd have to take the flat wet brush and just tweak the pressure and size curves. The last one is a variation of the previous one. I've simply replaced the brush tip by another one which is called "Oil_Soft". I think it is included in Krita by default. It gives it a more "featherly" quality which makes it pretty useful to generate a more natural or organic look. So I don't use this one for blending. It's the brush I've used for most of the herbs on the rocks here and the edges of the clouds there. 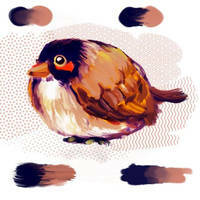 "Otherwise I'm using two additional brushes which are in fact a variation of this one. One is an even more opaque version of the same brush, whose opacity barely vary with the pressure, but whose size vary a lot more. This is the brush I've used for this entire painting as well as for the vegetation here and there. 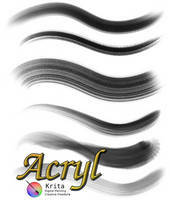 So to recreate this brush, you'd have to take the flat wet brush and just tweak the pressure and size curves." 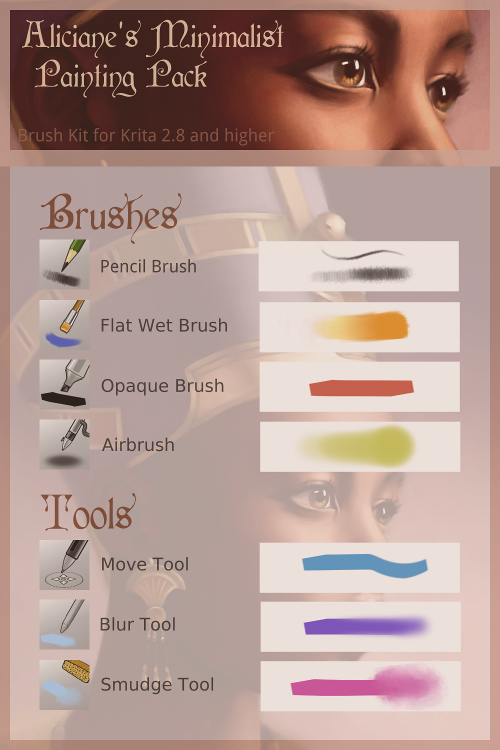 Okay so, I've tried to create a bundle with the two brushes I've talked about in my comment. Here's a link to download it. To import a bundle, you should go to "Settings -> Manage resources" and then click on "Import bundle". 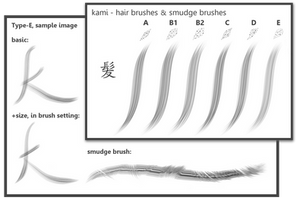 It appears to be working, here's a screenshot of the two brushes in the bundle like you said. Hmm, not sure how to help you... On my computer this works with both Firefox and Chrome so I don't know what the problem may be. Do you have a problem only with this particular download or does it concern every download on DeviantArt ? I don't know what Anime uses, but i'm trying to download it too, i use chrome, but it simply does nothing. Sent you a note with an alternative download link, tell me if it works better ! What size canvas do you usually use? Well, it depends on the final size of the picture. I came to the conclusion that what was most comfortable for me was to work on a canvas at least 3 times larger than the size at which the picture is supposed to be seen. For instance, if I want to make a 1920 pixel wide picture which can be used as a wallpaper, I'll work on a 5760 pixel wide canvas. All my work files will have this size and I'll only shrink the very final image. If you reduce the brushes size too much, to a size of a few pixels, their effects won't work properly. This is why the canvas size is increased, so you can paint the details easily. Consequently, I almost never use a 100% zoom. Most of the time, I work at a 33% or 50% zoom and for some very specific areas, I'll zoom up to 66%. 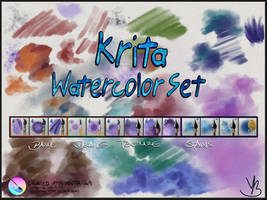 Do you use the windows version of Krita or do you use it on Ubuntu/Linux? Awesome brush set! I have played a little with Krita, but like you said it is hard to change software once you are use to one. I really should give it another go. Yes. My brother has said the same thing. I have only tried the windows version, and though I like it, it isn't as smooth as SAI is. At least on windows. But, I think it was originally created for Ubuntu/Linux systems, so it makes sense. They are constantly working on it so I will keep on eye on their progress. Definitely a software I will look into trying out (Would you consider it the best open source digital painting program you've tried out thus far? ) . I do appreciate the range of brushes you present here and you've made some great pieces through this software. Maybe not the easiest software to begin with, but definitely the best open source digital painting program I've tried, yes ! I may have to give it a shot after all (already installed though I hear a 2.9 version will be coming out soon). As much as I've enjoyed Gimp... it doesn't feel as intuitive painting and drawing wise as I had hoped. Reading reviews on Krita and seeing what you've produced through the program though... has me hopeful that this might just be what I've been looking for in a digital art program. I like the way you can customize the size and position of the layout elements; once I'd set all the panels to my taste I already felt more "at home"
Using 2.8 for now because the computer in which I've downloaded on has windows 8. So far, it's been running surprisingly smooth. Having painted on Gimp exclusively in the past... Krita blew me out of the water. I haven't even tested out all it has to offer yet. It definitely feels a lot friendly to digital painting than Gimp, which is exactly what I wanted from a digital art program. 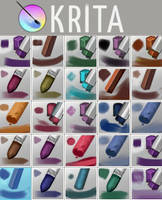 Let's spread our love for Krita this piece is awesome, I posted a more detailed comment on it ! I love Krita, the only real problem I have with it is that it can take a long time to move layers after I drag them up or down. Will try out these brushes when I get the chance. Argh, it's true that the software is not the most optimized one, especially on Windows. Do you often use a lot of layers or does it happen to you even with a few of them ? I find it mostly depend on the overall size of the image really, if the image is a smaller one it works much quicker. I'm kind of a layer addict ^_^; I really like the control it give me. And for the hack of it here are my Boot camped Mac stats. Guess it's mainly software related indeed I hope further releases will make it more efficient with large files ! Me too because other than the layers erck, I find it much better to work with the PS and Gimp when it comes to painting or drawing. but since I already familiar with Gimp and MyPaint, I rarely use it. but sometimes I use Krita for trying some new things, because it has a lot of cool brushes ! Thank you for sharing ^^ I didn't try krita yet, but I liked what I've seen of it.